Cetaceans, the term used to describe porpoises, dolphins and whales, are mammals, just like ourselves. They are warm-blooded, have mammary glands to feed their young, possess a four chambered heart and have hairs on their bodies. Like all mammals, whales breathe oxygen. They surface to exhale and take in a quick breath before submerging. During the past few centuries of rentless commercial whaling, this behavior was the Archilles' Heel of the great whales, because the whalers can spot the animal even from a distance and thus gave rise to the old, familiar cry, "Thar she blows!" Fortunately, apart from some small scale whaling operations in various parts of the world today, most shots coming from humans these days are from digital SLR cameras. There are approximately 78 distinct species of whales. Some are rather uncommon and difficult to locate, while others are whale watchers and photographers' favorite, like the Humpback whale and Orca (the largest member of the Dolphin family, also known as Killer Whale) because of their acrobatic displays and beautiful songs. Spotting whales is not a sure thing even when going out with a seasoned whale watching company. Knowing the time and place will greatly improve one's odds. Sperm and Humpback whales are most active during the winter months in Dominica and Hawaii, respectively. Humpbacks are also found during the spring and summer months around the waters of New England, Nova Scotia, Newfoundland and Alaska. Spring is also a great time to witness the Gray Whale migration off the west coast of North America. Killer whales can be seen during mid Spring to late Autumn in the Pacific Northwest during the salmon runs. Beluga whales are plentiful during the summer months near Churchill, Manitoba. Sperm and Southern right whales are often seen in the waters off Argentina and New Zealand during the winter months. There are of course many other spots around the globe where Cetaceans can be observed and photographed. Generally, most whale watching companies utilize boats ranging in size from small to large, carrying anywhere from 20 to 100 people or more. Whenever possible, I always go on a zodiac becasue it is faster and less crowded. On my cetacean photo shoots, I usually bring 2 camera bodies and 2 lenses. My camera equipment is from Canon, and the bodies are the 1D MK4 and 7D, and the lenses are the 100-400mm f/4.5-5.6L IS and 70-200mm f/2.8L IS II zooms. Visit the Equipment section on my website to see these gear. I use zoom lenses because a zodiac can approach whales and vice versa in a short time and a prime lens will be of little use. Quite a number of times, Humpbacks, Gray and Killer whales came right up to my zodiac and I wished I had a wide angled lens on my camera. The generally accepted global standard distance for viewing whales is 100 yards but sometimes it is hard to enforce and other times, over enforced. In a small zodiac, bouncing in the ocean, tripod/monopod and even Image Stabilers are of little use. I photograph in the Aperture (AV) mode and set my camera to 1 stop above the maximum and an ISO speed of at least 400 to obtain shutter speeds fast enough to freeze the action, especially on breaching whales. The Drive Mode is set to maximum continuous burst, the faster the better. If the light is poor or fading, I will go all the way up to ISO 1600 or open the lens up to its maximum aperture, in that order, if necessary. My AF points are set to the center with surrounding assist points turned on and Focusing Priority takes precedent over shutter release or frame rates. No point in getting blurry shots unless the subject is clearly in focus. California is one of the prime locations for whale watching and photography in the world. Gray, Blue, Humpback, and Killer whales plus others are found, at various times of the year, along the west coast of North America, from Alaska in the north, down to Costa Rica in the south. These areas can be reached by car or a few hours by air. However, my favorite spot for whale watching and photography is Maui, Hawaii. 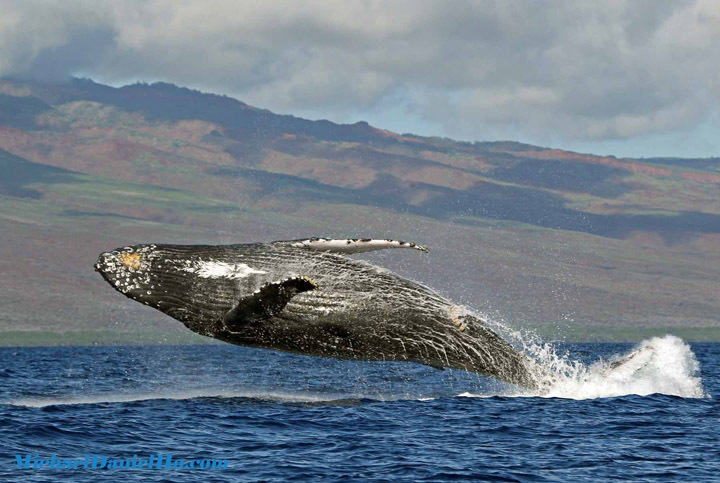 Humpback whales migrate to Hawaii in the winter to breed and give birth. The water is warm and mostly devoid of food, so Killer whales are generally not present, to prey on the calves. Since the Humpbacks are not feeding, the cows and calves are free to frolick and display their acrobatics. The bulls are busy trying to 'battle' each other for an opportunity to mate. The climate is warm and sunny. I put on my shorts, T-shirt and jump in the zodiac bare-footed. Going out a few hours a day from early morning to early afternoon usually will net some good whale photos. You can also read my other article on photographing wildlife in Alaska on my website. I photographed this breaching Humpback whale in Maui when I went whale watching on a zodiac. The equipment used was the Canon 1D MK IV and 100-400mm f/4.5 - 5.6 L IS lens. Visit my website to see the Equipment and Gear I used and view the slide shows and videos below to see these incredible animals in action around the world. There are also more photos of different whale species on my site. Excellent shot and wonderful photography. Hi Huynh. Thanks for your comment. You can drop me a line anytime if you have more questions on wildlife photography and equipment. Hi John. Yes, I have heard all about Hervey Bay and Migaloo down under your way. I usually use the center and the 4 or 8 surrounding AF points for wildlife photography, depending on the camera. The EOS-6D's 4.5fps may be a bit 'slow' for breaching cetaceans and the EF 70-200mm ca be a bit short, unless they come close to your boat. The Sigma 150-600mm is a bit more appropriate in my judgement. I will be heading to Alaska for some Humpback, Orca and Brown Bear photography soon. You can take a look at my other whale photography post as well. Stay in touch. Blue Whale? Amazing! If I would see it, I would be the happiest in the world! Maybe, I'll get luck and see it very soon. In my journey to Spitsbergen https://poseidonexpeditions.com/arctic/west-spitsbergen-and-ice-cap/ It will be a great cruise for my family! Hi Samantha. Every summer, Blue whales are routinely found in the Santa Barbara channel, about 2 hours drive north of Los Angeles. This is the most 'reliable' spot to see BW in North America.